THIS ITEM IS FOR IMPRINTING ONLY, YOU MUST ORDER A FOLIO(S) IN YOUR SHOPPING CART BEFORE ORDERING IMPRINTING! THERE'S NO RUSH SERVICE AVAILABLE. Everyday 100's of folios go to the art department for IMPRINTING. THEY REQUIRE TWO WEEKS BEFORE THEY SHIP TO OUR WAREHOUSE. PLEASE PLAN ACCORDINGLY!! IF YOU HAVE MORE THAN ONE FOLIO, YOU MUST CREATE AND COMPLETE ONE IMPRINT ORDER AT A TIME OR THE SELECTION WILL NOT WORK. ••PLEASE NOTE••THE FLORA & CUSTOM VIEW FOLIOS CAN ONLY HAVE IMPRINTING ON OUTSIDE! •• IT CANNOT BE IMPRINTED ANYWHERE INSIDE!! 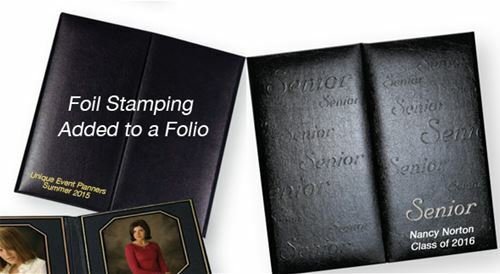 Not all folios have a SENIOR on the cover! Select the Front Cover Bottom Right Flap for this case! CALL US TOLL-FREE IF YOU HAVE A DEADLINE YOUR TRYING TO MEET!! Photo Folio Imprinting $20.00 per folio. 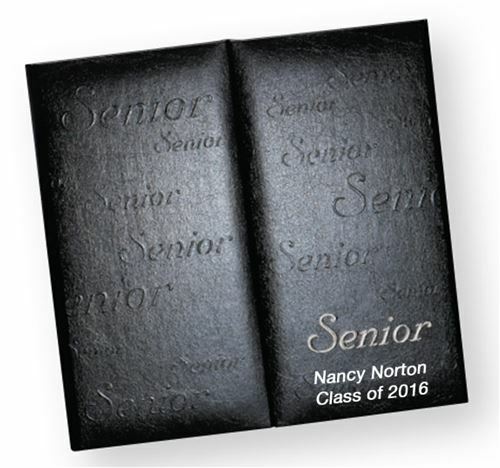 • Add a personalized message or make a custom die of your logo from submitted art work. • Contact us Toll-Free for Custom Dies! • Messages can be placed in several locations, see options below. • One location on the photo folio. Multiple can be done - CALL! • 1 or 2 lines of text, 26 characters & spaces long! Approximately 2'' x 4'' in length. • The size of type used will be determined by our art department based on your text.